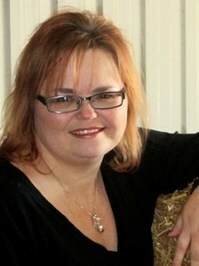 Today I'm really excited to be welcoming author L.S Murphy to The Cover Contessa today for an interview! Linda will be releasing her debut YA novel, Reaper, in January through J. Taylor Publishing! I CANNOT WAIT to read this book! It looks so totally awesome doesn't it? It's on the top of my list once it comes out, that's for sure! And now, without further a do, let's hear what Linda had to say in answer to my questions! That really depends on whether I outline or not. If I have an outline, I can usually get a draft done in a month or so. Then I’ll sit on it for a while and work on something else. Overall, I’d say about a year total, but I’m getting greedier with my time management so that may change. It’s all about the characters. They come up with the themes. I just roll with it. Since I have a full-time job and a family, I fit in writing whenever I can. Usually that means I get up at four in the morning. It’s the only time my house is quiet. You can have a great plot with flat characters. You can have fabulous writing with no story. You can have a predictable plot with interesting characters. It’s really a balance of characters, plot, and writing IMO. Finishing the first draft. Once you get to that point, you already have a book. You just have to make it better. Five. I wrote my first novel my first semester of college. That is still sitting in the notebooks I wrote it in. I wrote my second novel several years later, and I had no idea what the heck I was doing. My third novel gave me hope, but I still had a long way to go. With that third novel, I started to find my voice and learn the industry more. That’s when I really started to query and take myself seriously. Reaper is my fourth novel. I signed with Julia A. Weber of J.A. Weber Literaturagentur with my fifth novel this past June. My favorite literary character of all time is Elizabeth Bennett. I have a desk in my basement. That’s my primary location, but sometimes I write in the living room or the dining room. Sometimes I head out to Starbucks. A change of scenery usually gives me the boost I need if I start to struggle. They haven’t read them yet, but they are proud of me. I love baseball. If I could go to every St. Louis Cardinals game, I would. In fact ever, if I hit the lottery, I’m going to do just that. I don’t have a favorite book because I have SO many favorite books. Same with favorite authors. There are too many great authors out there to pinpoint just one. Kurt Vonnegut was the first author to inspire me. After I read “Harrison Bergeron” for the first time, I wrote my first story. I just finished a first draft on a contemporary YA and am currently outlining a new project, also contemporary YA. Thanks so much for stopping by, Linda! It was great having you here! I can't wait to read your book! Good luck and congratulations!